This Train founder and front man Mark Robertson generally has his tongue planted so firmly in his cheek, that you could easily imagine it to be a golf-ball sized plug of tobacky. Mark's offbeat sense of humor (He wants his epitaph to read "He dies as he lived --goofy") has guided his revved up roots-rock bandmates, guitarist Jordan Richter and drummer Cobra Joe, through a successful indie career to its second album for Organic Records, The Emperor's New Band. Mark explains, "Since we never had any expectations from it, This Train was only meant to be a part-time thing. It just became something to do to avoid boredom between our regular gigs. We made indie tapes and even our first CD, You're Soaking In It! , basically for our own entertainment. All of a sudden we found when we played shows, our records were selling. Now it's consumed a bigger chunk of our lives because there's a demand for records and concerts. We're thrilled, but it was never what we set out to do." Robertson, who spent his teens as a professional skateboarder, developed a career as an in-demand bass guitarist in the 1980s. After stints with artists such as Altar Boys, Brighton and Allies, Mark hooked up with a pop/rock band called The Stand. "The Stand was my transitional band into This Train," Mark recalls. "[Lead singer] Tony [Valenziano] started giving up more and more space to me, which was very generous of him. He let me wisecrack and do my thing, and that gave me the confidence to think I could have my own personality and not be afraid of who I was." Mark says the formation of This Train started as an outlet for a backlog of songs he had written between 1986 and 1992. "I had put together a little home studio and started writing songs, as a sort of therapy for myself. I started making little demo tapes; next thing you know, I've got 100 songs on a tape." The public's immediate response was often to dub This Train a Christian version of the rockabilly band The Stray Cats. 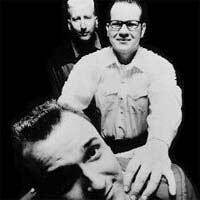 "I don't know that I'd call us a rockabilly band or a punk band or a country band or a swing band. When I was a kid, I used to say 'I love folk and I love punk and I love surf and I love rockabilly. It's too bad you just can't combine them all.' But This Train is the band where we went 'Why can't you do that?'" Mark admits that This Train might have remained little more than an expensive hobby, if not for the intervention and encouragement of the late Rich Mullins. "We had a conversation about my music when I first started touring with Rich and I gave him a copy of You're Soaking in It!, which he didn't listen to for six months. Then one day he called me from the reservation. I heard the record playing in the background and he was screaming about how much he loved the album. He started having us open for him at every opportunity, and started co-writing songs with me. I don't know how or why, but he became fanatical about This Train. He didn't like punk or rockabilly, but he thought the hybrid of the way we did it was much cooler." This Train's 1998 disc, Mimes of the Old West notched respectable sales numbers, thanks to steady touring and radio singles such as "I Saw the Light," "The Missing Link" and "A Million Years" (co-written with Mullins and Mitch McVicker). But that album's leadoff track, "We're Getting Nowhere (Fast)" remains closest to Mark's heart. The Emperor's New Band, might well be considered its close cousin in addressing the subject of celebrity. " I don't avoid popularity; I'm simply not impressed by it," Mark muses. "One of the greatest sins is thinking you're better than someone else is. But when you get in the entertainment system, it tells you that you are better. It's meant to elevate musicians to icon status. A Christian musician certainly doesn't have that luxury, but some choose to allow it anyway. We know why we do what we do and we don't need MTV to tell us we're good. We have a calling as musicians and God has tested that and confirmed that in our lives." According to Mark, trying to write about more serious subjects within the confines of a genre of music well-known for not taking itself seriously is a delicate balancing act. "It's not a style that's known for much depth--fast cars, cute girls, is about the extent of the subject matter. Mind you, those are probably the most important components of rock and roll, and I like both of those things! But then, how do you address something intelligent and spiritual within those confines? Sometimes the reason why issues of faith may seem downplayed on our records is because it's too important to us, not because it's not important enough. We're not ashamed of the gospel. You can listen to any of our records and know we're Christians. The Emperor's New Band is probably our most spiritually upfront record yet." As with many of the songs Mark writes, the tracks on The Emperor's New Band will likely touch listeners on a number of different levels. "I hate the whole notion of 'crossover,'" Mark says. "Yet if you look at songs like 'Wanna Be Your Man' or 'She's A Rocket,' at least from the titles, you could expect them to be crossover songs. It's simply that I like to argue for and against the same thing in a song. If I say something is a pet peeve, I'll attempt to do exactly that thing, only in a way I can deal with. 'She's A Rocket' is a great example. I originally meant for it to be about this guy trying to meet this girl who manages to elude him. Then the spiritual metaphor hit me when I went to flesh out the lyrics. Here's this girl who's an enigma. What she knows about her faith and her spiritual identity and her final destination is so foreign to the world. Then I thought about the girl at Columbine High School who was so sure of her faith that she could stare down the barrel of a gun and not deny it. That gives me hope to go out and face the world and be more blunt." That's not to say that the quintessential fun-loving spirit of This Train is lacking. The band tips its hat to former boss Rich Mullins with a cover of Mullins' "Screen Door;" there's also an ode to the group's favorite caffeinated beverage ("Magic Bean"), a spoken word bit ("Jazz"), and a reprise of the fan favorite, "Monstertruck." Mark says he misses the days when humor was often considered an essential part of a Christian album. "If you look at people like Larry Norman, Randy Stonehill and Terry Taylor, they all have a very sharp sense of humor. They are out-and-out funny on their records. Somehow, that's become less and less fashionable. We've started taking ourselves a little too seriously. I'd rather make fun of myself before somebody else gets the chance. At least I know my jokes will be true. The main reason This Train pushes that self-deprecating sense of humor is that we could all stand to get over ourselves from time to time." And The Emperor's New Band is nothing if not musically diverse; besides the expected roots rock, Mark says This Train was finally able to afford a horn section, though he stops short of calling any of the songs "swing." "We've wanted to use horns since the first record. And we finally had a budget that helped empower us to do that. I don't happen to think there's true swing on the album. There's jump blues with horns, there's rockabilly with horns. I even tried to do an old-fashioned Memphis R&B horn arrangement on the song 'Magic Bean.' And 'She's A Rocket' was supposed to be our version of that Mancini /'Peter Gunn'/ cop drama feel." But whatever musical sidesteps This Train may take, Mark says the band remains drawn not only to the music of the 1950s, but the fashion and the culture of the era as well. "I loved the optimism of that era. Inventors and designers were completely willing to produce useless technology just to create a paradigm, to set something in motion. That era was optimistic and inept at the same time, which reminds me of my band, in a way. How we can be as people. I think there's a real charm to that. "Since I wrote 'We're Getting Nowhere (Fast),' my career has never been better," Mark reflects. "God certainly has yet to call me to be a millionaire. It's a calling I would enjoy, but He hasn't called me to that just yet. But nothing I do is about me anyway. I only do anything I do because God has smiled on me. And He loves me not because of me but because He can't help Himself."